Shale Promises? Or Shale Spin? and contains late breaking information about the economics of fracking. * The life of a shale gas well is not 30 years, but more like 4 years? * An SEC rule changed caused most operators to overstate their reserves? * LNG import terminals are being converted for export? 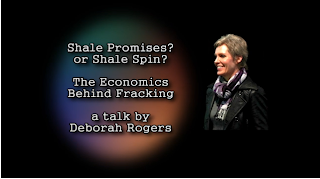 Please share this link with others who believe fracking shale will be good for the economy.